As much as I wanted to spend the day cooking yesterday, it just wasn't practical, we had dinner plans - a little bit of snow (24 inches) would not stand in our way. Last night we ventured out into the cold for a lovely evening with friends, and a delicious dinner by my friend Laura, an absolutely wonderful cook - we had luscious braised lamb shanks and au gratin potatoes, with a lemony sweet tart for dessert. One of the hits of the night was our introduction to Root, a root beer-ie, herb-y liqueur made in Philly by Art in the Age (www.artintheage.com) - a hypnotic digestive, yum! Today it was my turn to cook - I love to cook - welcome to my Super Bowl Sunday dinner - no wings, no pizza - not that I dislike either - I love both. But I needed to play in my kitchen today. 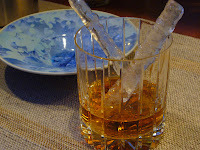 First, relax, playing in the kitchen should be fun - a warm up with a glass of Woodford bourbon was called for, complete with icicles to lend the chill factor - now I'm ready to cook! 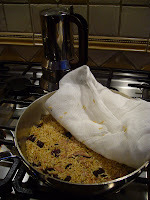 I've been wanting to make the Persian Rice with Duck Confit and Cherries recipe featured in the February issue of Martha Stewart's magazine and today is the day (http://www.marthastewart.com/recipe/persian-rice-with-duck-confit-and-dried-cherries). 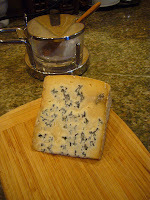 I was lucky enough to be in Kennett Square this past week to pick up duck confit from Talula's Table - the recipe called for duck leg confit but Talula's had duck breast confit - I couldn't pass it up. 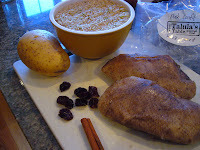 This is a very basic recipe and involves 6 simple ingredients - duck confit (duck cooked in duck fat - could it be better), dried cherries, cinnamon, rice, cilantro and potatoes. Here is the prepped dish ready to start cooking. It's one of those rice dishes where you cannot peek while it's cooking - the suspense was killing me. 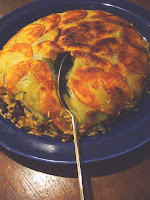 The bottom of the pan is lined with thinly sliced potatoes to create a crust, topped with the cherry jeweled rice and duck confit mixture. A layer of cheesecloth holds in the steam to finish cooking the rice. 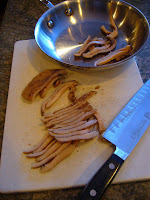 The recipe calls for you to remove the skin from the duck and has no further plans for it. 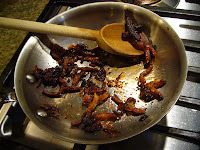 No duck skin ever went to waste in my house - time to make duck cracklins - YUM! 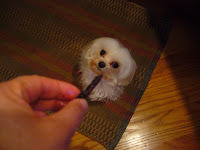 Duck cracklin is simply "cooked till crispy" duck skin - Lily loves them too! They are destined for our salad. 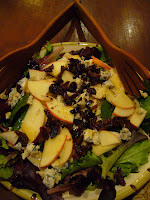 The salad for dinner is a mix of lettuces, crumbled Birchrun Hills Blue Cheese (http://birchrunhillsfarm.com/), apple slices, and duck cracklins, dressed with a lovely vinaigrette made with Balsamic Honey Vinegar. The timer sounds - - - the Persian Rice is done - did it turn out - - - YES - - - PERFECT - thank you Martha! The potato crust was crisp, buttery and laced with cilantro. The rice, cherry, and duck confit had a toothy bite and a beautiful marriage of flavors of sweet and savory. In our house every meal ends with a cup of espresso - my husband is our resident barista. And, no good cup of espresso is complete without chocolate. 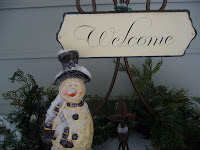 Tonight's chocolate is from Reppert's (http://www.reppertscandy.com/) in Pennsylvania's Oley Valley - dark chocolate covered crackers - the best! Lisa that looks so good! I did not know you drank bourbon you bad girl!